Top row: Regular (left to right) original packaging 1965, early 70s packaging, later 70s packaging. Middle row: Extra Mild (c1973), Extra Mild (later 70s),Plain. Bottom row: Classics (c1973), King Size (mid 70s), King Size (c1972). Part of the British Scene? 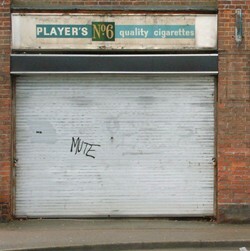 The Players No6 brand, introduced in 1965, was Britain's best selling cigarette brand for most of the 70s. Player's advertising claimed it was 'Part of the British Scene'. For the first half of the 70s, No 6 was number 1. Smokers were slowly waking up to the dangers of their habit in the 70s and health warnings first appeared on UK cigarette packets from 1971. However, what killed No 6 was the EU. In 1978, tobacco taxation was harmonised with the EU and cigarettes were taxed by retail price, rather than by weight of tobacco. This might sound a minor arcane worry for hard pressed Customs and Excise employees, but it changed the cigarette market overnight. Before this change small cigarettes were cheap and big ones were expensive. So King Size cigarettes were a luxury and small ones, like Player's No 6, were popular. After the tax change, the price difference between a pack of Player's No 6 and a pack of up-market Benson & Hedges Special Filter was almost incidental; 20 No 6 cost 52p and 20 Benson & Hedges cost 57p. Overnight sales of No 6 tumbled and in the status conscious 80s, No6 was about as popular as a pair flares and a kipper tie. The brand quietly disappeared in 1993. The No 6 name came from Players' marketing department; it had no real meaning. Like Embassy, launched in 1962, Players No6 coupons were an important part of the marketing strategy. Players No6 coupons were exchanged for gifts from a catalogue like Green Shield Stamps. Like Embassy, No6 was mainly a filter brand. Although there was plain version, see the beige and brown pack on the middle row on the left in the picture (above left). No6 targeted a different market from Embassy, the smaller Class 'A' market, the cheaper end then dominated by Woodbine. The No6 launch coincided with a swing towards smaller, cheaper, cigarettes in the face of rising tobacco duty. Long-standing buyers of cheaper cigarettes were also finally catching onto the perceived health benefits of the filter. Thus No6 was able to match the phenomenal success Embassy achieved a few years earlier. Player's No6 had a working class image, although the packaging also had a feminine appeal. Players No6 consequently appealed to female smokers. In the Michael Caine film, "Get Carter", Jack's niece, Doreen, smoked No6. Carter himself smoked Gitanes. The feminine appeal of the packaging was partly deliberate, as manufacturers aimed for androgynous packaging for maximum appeal to both sexes. By 1970 Players No6 had edged ahead of Embassy as Britain's number one cigarette, taking an incredible 21% (1) of the entire UK cigarette market for the filter brand alone. Players celebrated this popularity in their advertising. One campaign showed market stalls under the tag line, 'The most popular filter cigarette in Britain'. Players also claimed that No6 was 'Part of the British scene' in a campaign of the early seventies. Packs of No6 appeared alongside scenic views of Studland Bay in Dorset and Kirkstone Pass in the Lake District, amongst other landmarks. They then celebrated the ordinariness of No6 with the campaign 'People like you are switching to No6', which showed pictures of workers and ordinary people. As concerns about the health risks of smoking became more prominent, many manufacturers launched mild versions of well known brands. Silk Cut, already a mild brand had a strong lead in this sector. Players introduced No6 Extra Mild in late 1972. 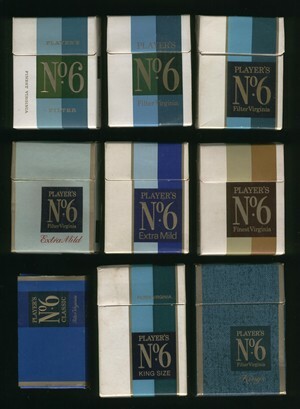 Players No 6 Extra Mild was packaged originally in a light blue box, with the No6 logo on a dark blue rectangle. The box appeal was feminine and the intended market were women aged 25 to 45 with working or lower middle class occupations. Later the packaging was changed to be similar to the No6 regular, but with a light blue and mid blue stripe. (see photograph above). Smokers switching to No6 were persuaded by the Player's name and the image of the cigarette which was perceived as sociable; remember this was the 70s. Also the price was attractive. However, No6 Extra Mild's sales were disappointing. It little dent in Silk Cut's lead in this sector. By 1976 Player's No6 Extra Mild's market share was only 0.6%, well behind Silk Cut's 6.2%. NB: There is no evidence to suggest mild cigarettes are any better for you than regular ones. Like many other lower to mid range cigarette brands, Players launched a King Size version of No6, Players No6, in the early seventies. Like Extra Mild a different style of packaging was initially used, featuring a textured background and a more masculine look. As with Extra Mild, Players reverted to a similar pack to the Regular No6 later in the 70s. In the late 70s in the wake of changes in taxation, Player's re-launched No 6 King Size with a new packet, left. The King Size pack bore the Royal Warrant, by appointment to HM the Queen Mother. This style of pack continued into the 1980s. A huge advertising campaign featuring surrealist images backed up the the change. How much did Player's No 6 cost? In 1972 a pack of 20 Players No 6 cost 21p for Regular or Extra Mild and you got five vouchers or coupons. Plain cigarettes were more expensive, as they contained more tobacco. Player's No 6 Plain cost 24½p (remember half pennies?) and also came with five vouchers. Players No6 King Size came with seven vouchers and cost 29p. If these prices look cheap, they were, allowing for inflation these prices in today's money are £1.90 for 20 Players No 6 Regular or Extra Mild, £2.20 for 20 No 6 Plain and £2.60 for 20 No 6 King Size. Player's No 6' reign as Britain's number one cigarette only lasted until the mid 70s. Its market share declined from the mid seventies and fell off a cliff after 1978. By the mid 80s, the brand was all but forgotten achieving only a 2% market share. 'Part of the British Scene'? Possibly, but the health issues around smoking and the European Community saw it off in the late 70s. Even in King Size form, No 6, a cheap 70s' working class brand, stood no chance in the status obsessed 80s. It was a part of the 70s' scene long forgotten. With such a popular brand there was a huge amount of marketing paraphernalia. As well as the cigarette packets themselves, there were decanters, beer mats, sports programmes and many other items featuring Players No 6. Also look out for magazine advertisements. l would be interested in taking a pack. "We always called them "Numbies"
They were very much the cigarette of choice of the school child. "i have an unopened pkt of 20 no.6 king size. I would be interested in one 20 & one 10 pack if you still have them.